I love a good pizza night. It’s fun, delicious, and convenient. But the healthiest? Not so much. I’ve been making stuffed zucchini boats for a while now, filling them with ground turkey, spicy sausage, or making a meatless version. Zucchini boats are tasty, filling, low-carb, gluten-free, and quick and easy to make. Which is why I love that pizza stuffed zucchini boats are a thing. They satisfy pizza cravings and are much lighter. They’re also ready and on the table in about 30 minutes! It’s the first day of October today, and October is Italian Heritage Month. 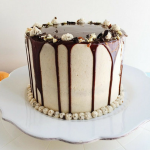 You guys know that I love my Italian roots, and some of the most popular recipes on P+P are my spins on Italian classics: Italian Cannoli Cake, Vegan Italian Stuffed Peppers, and Italian Chopped Kale Salad, to name a few. Now, let’s update pizza to a low-carb and healthy meal that still tastes amazing. I have even made non-believers into zucchini boat fans with this recipe! Zuccanoes is a very, very fun word to say. 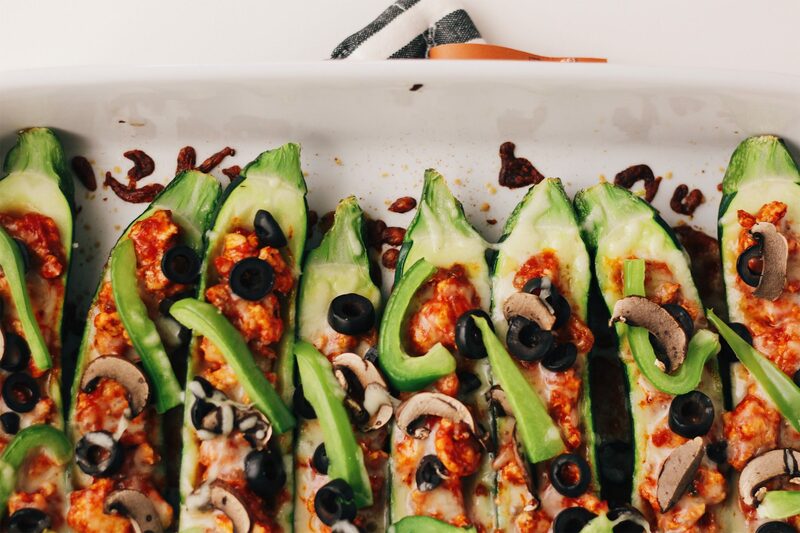 No matter what you call these, I’m sure you’ll love pizza zucchini boats. What sauce to use for zucchini boats? No need for homemade, but I highly suggest a good quality marinara. The marinara is going to give your pizza zucchini boats amazing flavor, especially since we aren’t loading on the fat and cheese here. I used and recommend Rao’s Homemade Marinara Sauce (available at your local Walmart for a great price!). 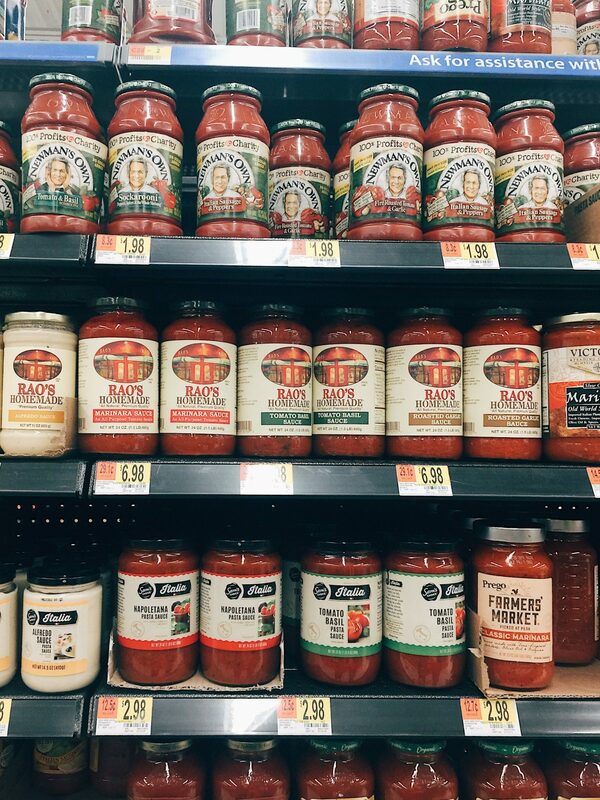 This is my go-to store-bought marinara for creating quick and delicious recipes. Rao’s Homemade Marinara Sauce is made with only natural ingredients and no fillers, added sugar, or artificial colors. It’s gluten-free and made in small batches. The marinara has a robust, balanced flavor of sweet Italian tomatoes, garlic, basil, pure olive oil, and onions. 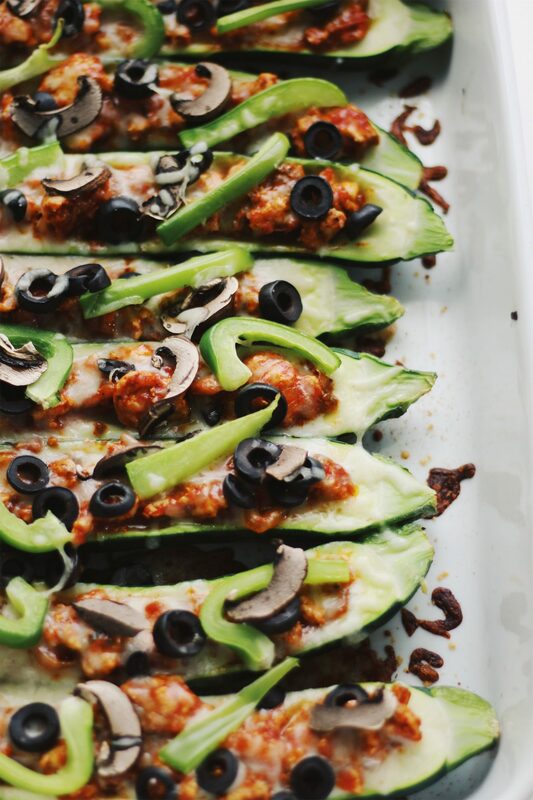 It adds so much flavor to these Pizza Stuffed Zucchini Boats! Zucchini boats are a great low-carb alternative to traditional, heavier fare like pizza or lasagna. 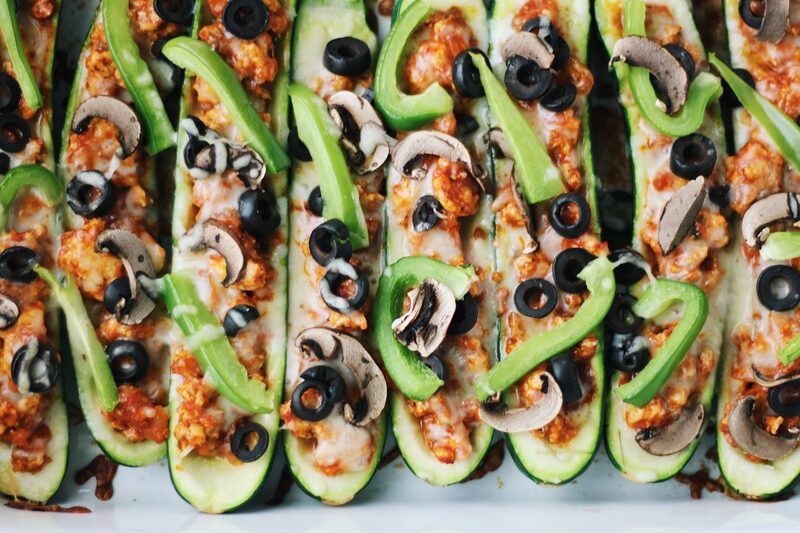 However, be mindful as zucchini boats, specifically pizza zucchini boats, can still be on the unhealthy side. 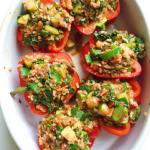 These are made with ground turkey instead of processed meats and contain only a little cheese. 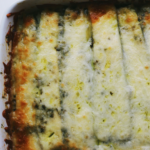 You only need a little cheese for flavor (and to hold the zucchini boats together!). We add a ton of flavor to these pizza zucchini boats with shallots, garlic, spicy and pickled pepperoncinis, salty olives, and fresh veggies. Buy larger zucchini as they make for sturdier boats. Slice zucchini in half length-wise and scoop out the center of the zucchini. You can reserve the scooped zucchini for a later use (like muffins, bread, or scrambles). Cook any meat before stuffing your zucchini boats. Top your boats with your meats, vegetables, toppings, and cheese. Bake until zucchini is tender and the filling is bubbly! 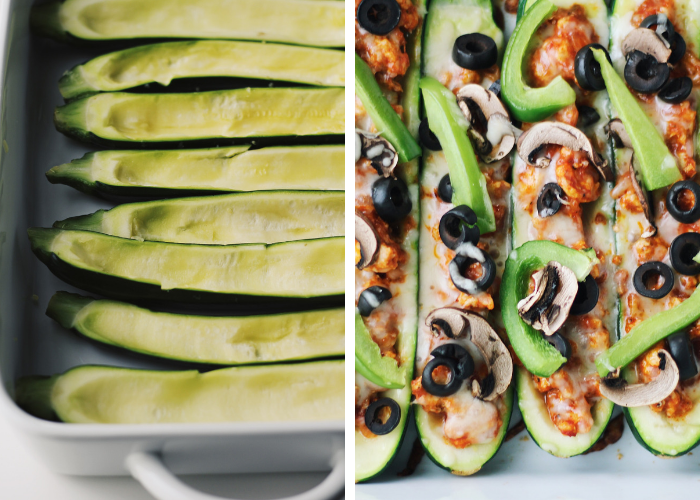 We hope that you make and enjoy these Healthy Pizza Stuffed Zucchini Boats! Get Rao’s at your local Walmart for a great price, and find some more delicious inspiration here. 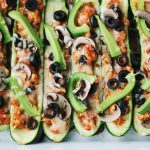 These Pizza Stuffed Zucchini Boats are made with ground turkey, quality marinara, cheese, and all the fixin’s! They’re an easy and healthy meal. Slice zucchini in half length-wise and scoop out the centers*, leaving some flesh on the bottom and sides but creating a hole for the filling. Set the zucchini on baking trays. Heat the olive oil in a saute pan and cook the shallot and garlic until softened. Add the ground turkey and cook until cooked through, breaking up with a wooden spoon. Season with sea salt, pepper, and the thyme, oregano, paprika, and red pepper flakes. Add in half the jar of marinara (reserving the rest for serving). Cook until bubbling and remove from heat. Spoon the turkey and marinara filling into the zucchini boats. Top with mozzarella and sprinkling of Parmesan. 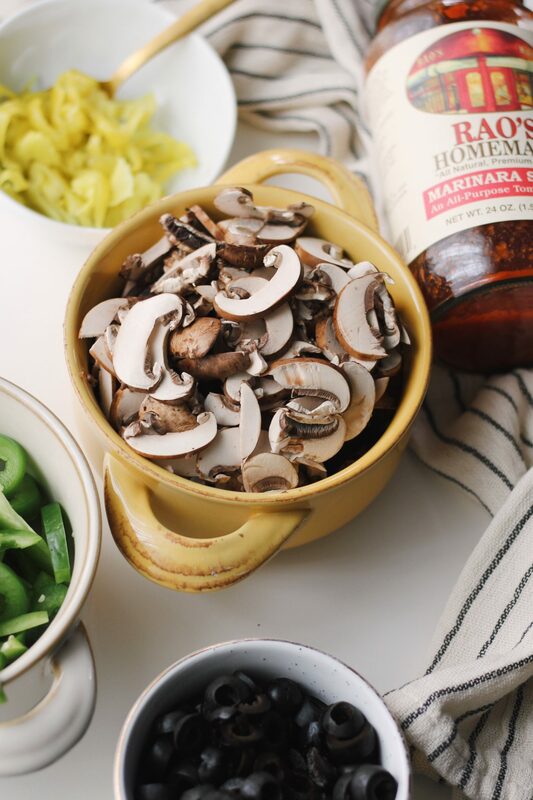 Arrange thinly sliced mushrooms, olives, and peppers on top. Sprinkle with some additional cheese. Bake the zucchini boats until the boats are tender and the cheese and filling is bubbly, 20-25 minutes. 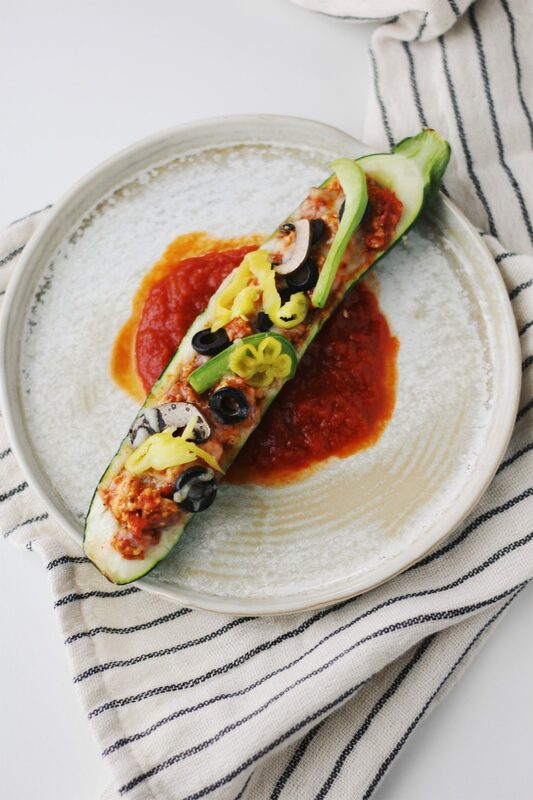 Warm the rest of the marinara sauce and serve the zucchini boats with additional marinara, Parmesan, and topped with some pepperoncini peppers. *Reserve the scooped out zucchini for bread, muffins, or scrambles/omelets. 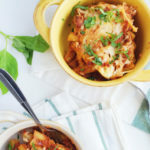 To make this recipe paleo or Whole30, omit the cheeses. Rao’s Marinara is Whole30 compliant. 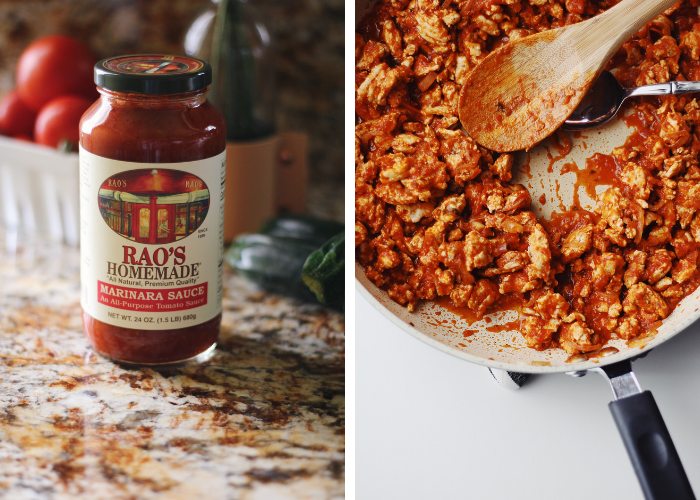 Purchase Rao’s Homemade Marinara Sauce at Walmart! Its a must try for vegetarian. 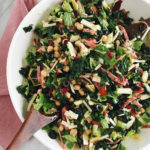 It looks delicious, pretty, easy and healthy. What happens if I leave out the olive oil? Of course, I ate way more than the recommended portion, but it’s veggies, so that’s okay, right? I switched out the ground turkey with diced Italian chicken sausage, but followed everything else. The portioning of the filling to zucchini was spot on, the pizza flavors really came through without all the bready carbs. You’re a genius babe. Also, I am really digging this font in this text box. OMG these sound SO good! Looking good and so healthy! I am so excited to try some. I’m sure my kids would eat this! 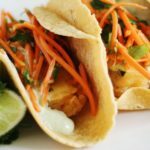 Rao’s is my #1 favorite sauce ever, and I use it in all of my recipes. It tastes just like homemade but without the hassle. This is so perfect I have zucchinis at home and I was thinking what to make for dinner. I will definitely making it tonight this looks so healthy delicious. Awesome, Farrah! Let me know how it goes! Zucchini is one of my absolute favorite veggies. 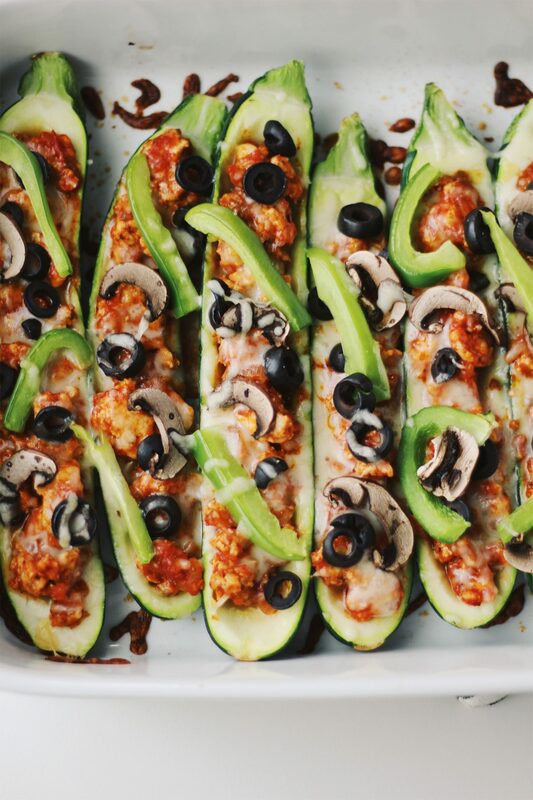 my sister makes all kinds of stuffed zucchini boat recipes, but I don’t think we’ve tried it with a pizza filling yet! I’m curious – are the zucchini boats soft or crispy? I’ve had zucchini chips that were baked a little and then they added the pizza toppings for a crispy version, but I wonder if these would be too soft for my pleasure. Hi, Ashley! They’re tender but not over-cooked or mushy. Some people bake their zucchini before filling them, and then put them back in the oven, but I think that makes them way too soft for my taste. What a terrific way to have healthy pizza. I love this idea and can’t wait to try it for my family. The young kids may not care for it but the adults – amazing. I have used Rao’s sauce and I agree it is very good and tasty. I never thought of using a zucchini “boat” as a holder. Although I would leave out the turkey meat and perhaps use chop meat this recipe also sounds great for a diabetic.